The Hallaton helmet was shown in public today for the first time since it was buried 2,000 years ago. JD Hill reveals to us the significance of this discovery and the work behind the scenes that has led up to its display. This morning a rare and extraordinary Roman helmet was shown in public for the first time since it was buried 2,000 years ago. A decade after its discovery in Leicestershire, the painstaking process of reconstruction, and conservation is complete and it is ready to go on display at Harborough Museum. Still in the soil block in which it was found, the fragile helmet was brought to the British Museum where initial study in the Department of Conservation and Scientific Research revealed a much more complex assemblage than had been expected. British Museum conservator Marilyn Hockey, and colleagues Fleur Shearman and Duygu Camurcuoglu undertook the micro-excavation, stabilisation and reconstruction of the hundreds of fragments – a task described as being like a 3D jigsaw puzzle. Thanks to this process we know the helmet was probably made between AD 25 and AD 50 and that it was crafted from sheet iron, covered with silver sheet and decorated in places with gold leaf. This decoration features a wreath, the symbol of a military victory, and a scallop-shaped browguard, which shows the bust of a woman flanked by animals. The cheekpieces depict a Roman emperor on horseback with the goddess Victory flying behind and, beneath his horse’s hooves, a cowering figure (possibly a native Briton). Clearly, such an object would not have been cheap to produce, so we can say with some certainty that it was the property of someone very important, perhaps a high-ranking Roman officer. It was found by members of the Hallaton Fieldwork Group and professional archaeologists from the University of Leicester Archaeological Services and caused quite a stir at the time. The original finders joked that they’d discovered a “rusty bucket”, but in fact they’d got one of the earliest Roman helmets found in Britain, believed to have been buried in the years around the Roman Emperor Claudius’ invasion of AD 43. But that wasn’t all they’d found. 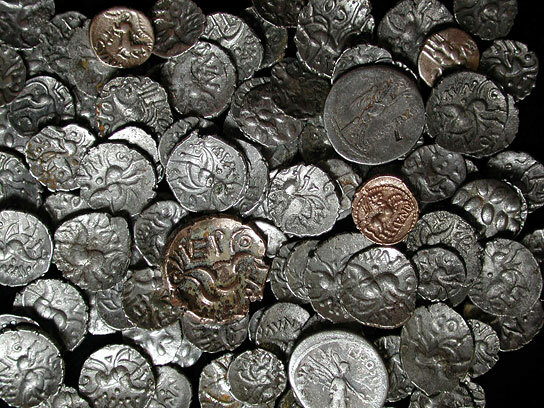 Some 5,296 Iron Age and Roman coins were also unearthed, most of them locally-made and dating to about AD 20/30-50. That’s almost 10 percent of all known surviving British Iron Age coins – and the largest number of Iron Age coins ever excavated in Britain – found at this one site. Add to that, evidence suggestive of ritual feasting dating back to the first century AD and the significance of this discovery really begins to emerge. Collectively these finds became known as the Hallaton Treasure and were acquired by Leicestershire County Council with help from a large number of funding bodies, organisations and institutions. But why was it buried in east Leicestershire (very likely by the hands of native Britons)? The answer is; we just don’t know. But there are a number of theories. Perhaps it was actually owned by an important local man who served in the Roman cavalry before or during the Roman conquest. He might have chosen to bury his highly-prized helmet at his local shrine as a gift to the gods on his return home. Or, perhaps it was a diplomatic gift to a supportive local population. It has also been suggested that it was spoil of war, or captured during a battle or a raid. We may never know for sure why this amazing collection of objects ended up buried in the east Midlands, but it certainly speaks of a fascinating moment in the history of this part of the world and, in its current state, the skill and dedication of conservators, scientists, archaeologists and curators here at the British Museum and in Leicestershire. As for the helmet, if you ask me it will become a new iconic object of the Roman conquest. Future books and TV programmes about this momentous event will have to feature it. That’s the sort of key find this is. The Hallaton Helmet will be displayed permanently at Harborough Museum, Market Harborough, Leicestershire from Saturday 28 January alongside the other finds from the Hallaton Treasure. The helmet will not be on display at the British Museum.